A proud family-owned and operated business, Corbon Ammunition is one of the most respected manufacturers in the ammo industry. Corbon developed a reputation for quality and performance with their high-energy JHP loads. The company delivers the same level of quality and performance with their new DPX line. With deeper penetration and impressive terminal performance, Corbon DPX is ideal for law enforcement and civilian personal protection. 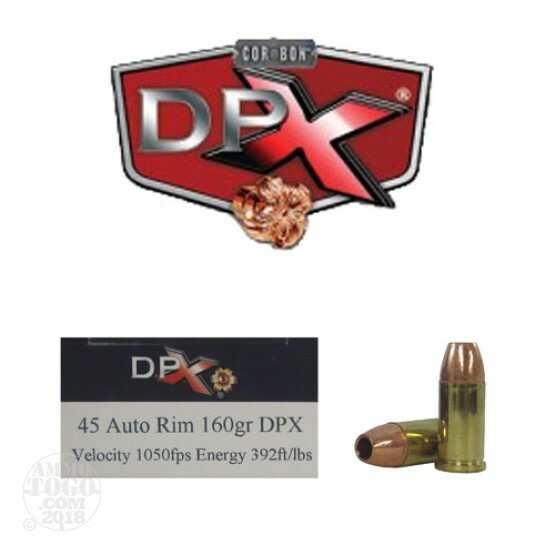 This package contains 20 rounds of Corbon DPX .45 AUTO RIM ammunition. The .45 AUTO RIM (also known as 11.5x23R) is a rimmed cartridge designed specifically for revolvers originally chambered for the .45 ACP cartridge. Each round is loaded with a 160 grain Barnes X hollow point projectile. Constructed of solid, heat-treated copper, these solid hollow points eliminate core/jacket separation to deliver 100 percent weight retention. The permanent crush cavity created by these unique projectiles is considerably larger than those created by standard hollow points. Barnes X bullets feature a deep forward cavity which allows the nose to peel back upon target impact, forming four sharp copper petals. When viewed from the front, the petals form a perfect “X,”, giving the Barnes X its name. These expanded, razor-sharp petals work to carve a massive wound channel through soft tissue, even after passing through thick clothing or tough steel barriers. This ammunition is factory fresh, non-corrosive, boxer primed, and features reloadable aluminum casings. Each round produces a muzzle velocity of 1050 feet per second and 392 foot pounds of muzzle energy.